Why Is College Enrollment Dropping? 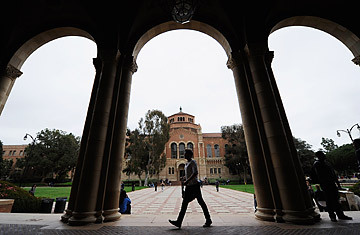 A student walks near Royce Hall on the campus of UCLA on April 23, 2012 in Los Angeles. Harvard, Yale and a few other selective universities may be announcing record numbers of applications for the semester beginning in the fall, but higher-education officials are fretting about ominous signs that overall college enrollment is starting to drop. More schools have space still available than at any time in at least a decade. Already, in the academic year just ending, many universities had to offer greater discounts just to fill seats. Yet fewer admitted students enrolled, and more than 40 percent of private colleges reported enrollment declines. Even community colleges  drowning in double-digit growth the past few years  experienced enrollment dips this year. "We are seeing the beginnings of a cool-down," said Barmak Nassirian, associate executive director of the American Association of Collegiate Registrars and Admissions Officers. "Most of the apparatchik within higher education hope this is just a hiccup," Nassirian said. "But I tend to think we have pushed the envelope as far as we can and we are in for a major realignment of some kind." The warning signs come at a time when policymakers from the president to governors are pushing to increase the proportion of the nation's population aged 25 to 34 with post-secondary credentials, which the Organisation for Economic Co-operation and Development says has already fallen from first to 16th in the world. While the number of students graduating from high schools has declined slightly since building to a peak of more than 3.3 million in 2009, the cause of the college enrollment drop-off is largely skyrocketing tuition and concern about debt, Nassirian and other higher-education officials said. "I do think we've reached a tipping point in terms of what cost might do," said David Hawkins, director of public policy and research at the National Association for College Admission Counseling, or NACAC. "The cost of college is really beginning to alarm families. And that creates a real threat to enrollment." The downward trend is especially squeezing private colleges, other than the most elite schools with the largest endowments, such as Harvard, which accepted a record-low 5.9 percent of the 34,302 students who applied for Fall 2012 admission. Princeton took just 7.9 percent of its applicants, and Yale 6.8 percent. More than half of other private colleges, however, had to give more discounts this year than last to continue to attract students, the credit-rating firm Moody's reports. Moody's found that 41 percent saw enrollment fall anyway. More than a third had enrollment declines of at least 5 percent, according to the National Association of College and University Business Officers. "When the going was good  the stock market was booming, unemployment was low  that sector did well," Nassirian said. "Parents felt they could afford this." Now, he said, second- and third-tier private colleges with small endowments may themselves be in trouble. "Some of them are at risk over fairly short timelines," he said. "These institutions will have increasingly greater difficulty attracting paying students who can balance their budgets. And five years of bad news can put you under. We are seeing early signs of long-lasting trouble." Already, at least 375 colleges report space still available for the fall, even at the end of the admission season, according to NACAC. That's up from 279 last year, and the highest number this century. Seventy percent are private. The percentage of accepted students who actually enroll in any university or college, which is called the "yield rate," has fallen from about half to 41 percent in the last decade, NACAC says.